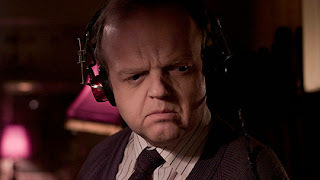 Berberian Sound Studio edged its way into my top 10 genre films of 2012 despite leaving me a little confused. Now, upon second viewing, I like it even more! It is a real treat for lovers of cinema, especially fans of the under-appreciated field of sound design. If you are a horror fan and go in expecting some kind of neo-giallo, you will probably be disappointed. The film is, however, a loving portrait of sound, and what better palette for that than gialli cinema? Toby Jones plays timid sound mixer, Gilderoy, who is flown to Italy to work on an Argento-esque film called "The Equestrian Vortex." The uptight Englishman is thrust into a world of exuberant and aggressive personalities who bully him nearly into submission. The graphic nature of the giallo film and the moral corruption of his new employers push Gilderoy into a downward spiral where the lines between reality and fiction become blurred. While it may be a psychological thriller on the surface, Berberian Sound Studio is so alluring because it's like poetry of sound by way of Italian horror. Every inch of the movie looks gorgeous and it puts the viewer right there behind-the-scenes of a giallo film. The coolest part is we never actually see "The Equestrian Vortex" being filmed but it feels like you're watching it as it is told entirely through sound. As the meek fish-out-of-water Gilderoy, Toby Jones is fantastic as always. Claustrophobia and xenophobia warp the mind of this sheltered little man, creating his own version of a nightmare all the while amplified by more traditional nightmare fare (witches, goblins, etc) from the giallo film's sound reels. As the film's pushy producer Franceso, Cosimo Fusco is also great. This guy creates more tension and terror than any screeching witches! Berberian Sound Studio pays tribute to a bygone era of filmmaking and craftsmanship while delivering a suspenseful tale about a slow descent into madness. While Italian horror fans may cream their pants at the idea of a giallo throwback, this is not really a horror film. Still, there are plenty of references and visual/audio cues that gialli nerds will thoroughly enjoy. If you fancy the idea of being thrown back to 1970s Italy in the sound studio of a giallo flick, this is as close as it gets.